Win Scott Eckert.com: The Green Ghost: Declassified - Final Cover Reveal! 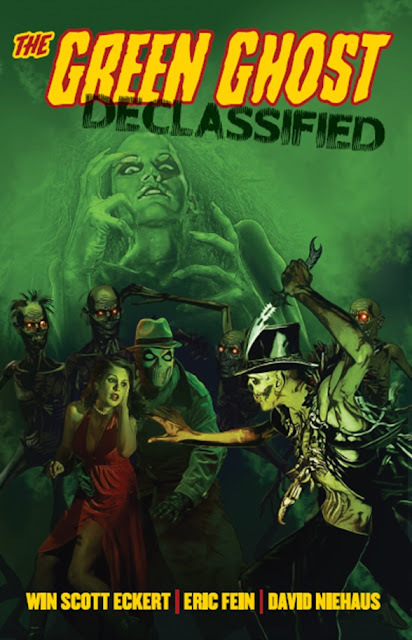 The Green Ghost: Declassified - Final Cover Reveal! Reveal! Final cover treatment for The Green Ghost: Declassified! Coming soon from Moonstone Books, with a mix of prose and comic stories by Win Scott Eckert and Eric Fein, and interior illustrations by David Niehaus. Cover for the softcover trade edition by Malcolm McClinton, with thanks to Erik Enervold at Simian Brothers Creative for his fantastic cover design! The Green Ghost: Declassified is listed in the August 2016 Diamond Previews catalog and ships to local comic shops in late October.